Please note that the content of this book primarily consists of articles available from Wikipedia or other free sources online. Floris van Wevelinkhoven was Bishop of Münster from 1364 to 1378 and Bishop of Utrecht from 1378 to 1393. 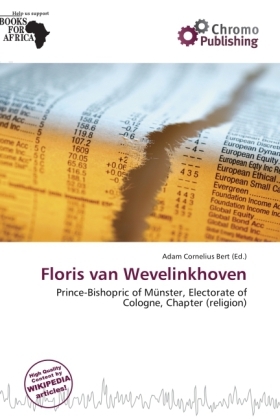 Floris van Wevelinkhoven descended from high nobility, and started his career in the Bishopric of Cologne, where he climbed to the position of vicedeacon of the cathedral chapter in 1356. He was appointed bishop of Münster by the pope as a result of several changes in positions, in which the Bishop of Liège Engelbert III of the Mark was moved to Cologne, the bishop of Utrecht Jan van Arkel was moved to Liege, and the bishop of Münster Jan van Virneburg was moved to Utrecht.